Make plans now to join us for the 6th International Symposium on Focused Ultrasound, to be held October 21-25, in Reston, Virginia. The four-day program will explore the latest in using focused ultrasound to treat a range of conditions across oncology, neurology, women's health, cardiovascular disease, pediatrics, and more. We will also address challenges to widespread adoption, such as technology gaps and commercialization efforts. Gary Shapiro, President and CEO of the Consumer Technology Association (CTA)™, which annually produces CES®, the largest technology and innovation show in the world, will deliver a keynote address at the 6th International Symposium on Focused Ultrasound on Tuesday, October 23, 2018. Shapiro will discuss the importance of innovation at the intersection of technology, business, and healthcare. The Symposium’s newly released preliminary program provides an overview of daily topics. The meeting begins with a Welcome Reception on Sunday, October 21. Plenary sessions and panel discussions start the following morning. We have also built in ample time for ad hoc meetings and collaboration among attendees, a central goal of the Symposium. In 2017, the field of focused ultrasound increased markedly in both size and scope. More than 100 clinical indications are now in various stages of research and development, and we have also seen a shift as the field matures toward the goal of achieving successful commercialization. Our 2017 Year In Review Report highlights the Foundation’s work as a driving force for this progress. The March issue of DOTmed’s Healthcare Business News highlights some of the key advances and challenges in pediatric medicine. An article by the Foundation’s Chief Medical Officer, Tim Meakem, MD, adds to the conversation with an overview of the current state of the field for using focused ultrasound to treat young patients. The article shares the story of a 3-year-old patient, the youngest person to be treated using focused ultrasound. How well do you know ET? Test your knowledge of this benign, but often debilitating, disease. 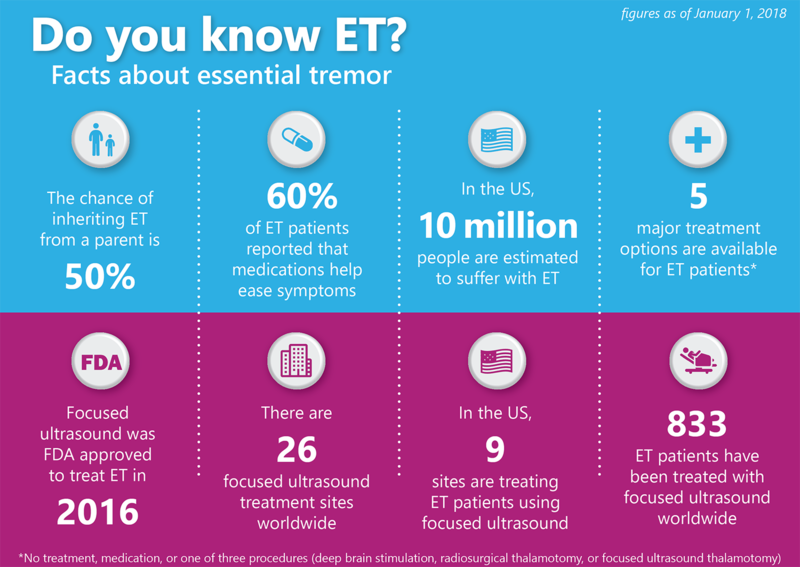 Learn more about ET and connect with other patients. In recognition of Essential Tremor Awareness Month, Insightec has partnered with a patient whose life has been changed by focused ultrasound. Alexandra Lebenthal was treated for essential tremor at Weill Cornell Medical Center in 2016. Throughout the month, Insightec is releasing weekly videos as part of their webcast series called “Coffee with Alex,” in which Alexandra discusses her diagnosis, treatment, and how she’s feeling today. EDAP TMS has announced that Cigna is the first major private health insurance company in the US to reimburse prostate cancer patients who have failed radiation treatment and are eligible for focused ultrasound as a salvage therapy. Cigna is one of the five largest payors in the US, covering 15.9 million lives. The new policy aligns with National Comprehensive Cancer Network guidelines recognizing that some men with localized prostate cancer may benefit from focused ultrasound and acknowledges the treatment as "medically necessary as a local treatment for recurrent prostate cancer following radiation therapy" for patients meeting specific medical criteria. Sunnybrook Health Sciences Centre announced that it will direct $10 million to establish the Harquail Centre for Neuromodulation, where researchers will explore using image-guided technologies like focused ultrasound to intervene in brain circuitry. The team plans to target some of the most challenging brain disorders like Alzheimer’s disease, depression, OCD, cancer, Parkinson’s, ALS, PTSD, and more. Nir Lipsman, MD, PhD, will direct the Centre. Sunnybrook was named one of the Foundation's Focused Ultrasound Centers of Excellence in 2016. The Foundation has recently funded four research studies. Three of the projects – at Ohio State University, Weill Cornell Medical Center, and Stanford University – aim to improve the way focused ultrasound is used to treat brain disorders. The fourth – at the University of Virginia – will investigate whether focused ultrasound can improve the effectiveness of chemotherapy in breast cancer patients. Focused ultrasound researchers are continually searching for ways to improve the technology and expand its use. This month, we share technical articles that describe how focused ultrasound could be used to slow the growth of aggressive brain tumors and treat internal organs that are in motion. Technological advances could also improve the speed of treatment and decrease cost of procedures performed through the intact skull. We recently interviewed Arun Menawat, PhD, CEO of the Toronto-based focused ultrasound manufacturer Profound Medical. The company's TULSA-PRO device is a catheter based MRI-guided system for the ablation of diseased prostate tissue from the inside out. Dr. Menawat describes what makes Profound Medical unique and shares his vision for the company's future. Meggitt A/S, based in Kvistgaard, Denmark, supplies piezoceramic materials that are used to create focused ultrasound transducers. To learn more about this important supply chain company, we interviewed Rasmus Lou-Møller, Meggitt’s Director of Engineering and Business Development. French company EDAP TMS has created a new US-based prostate cancer patient registry for urologists. The Focal Robotic Ultrasound Ablation Registry, or “FoR-UsA,” has been designed to collect clinical data on patients treated with EDAP’s Ablatherm® Robotic High Intensity Focused Ultrasound (HIFU) device. The database will track baseline and follow-up information on patients undergoing partial-gland ablation of the prostate. Participating organizations include the University of Miami Miller School of Medicine, Weill Cornell, Houston’s Methodist Hospital, Cleveland Clinic, Duke University, and the University of Southern California. EDAP plans to use registry data for additional FDA approvals and to support health insurance reimbursement efforts.